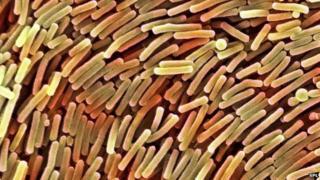 Bacteria that naturally live inside our digestive system can help prevent allergies and may become a source of treatment, say US researchers. The team at the University of Chicago showed a group of bacteria - Clostridia - could block peanut allergies in mice. They hope to harness the bacteria in a pill form - or replicate their effects with a drug - in order to treat allergies. Experts said it was a "very exciting" discovery. For every one cell that builds up the human body there are ten bacteria living on or in us. There is an emerging school of thought that this "microbiome" may be helping to fuel a rise in allergies around the world. The research group performed experiments on mice brought up in perfectly sterile environments and had no bacteria in their gut. These animals had a strong immune response to peanut - an allergy that can be deadly in some people. The team then investigated whether adding different bacteria to the digestive tract of the animals had any effect. Only the Clostridia group of bacteria - which includes some disease causing species such as C. difficile - could prevent the allergic reaction. Lead researcher Dr Cathryn Nagler told the BBC News website: "The first step is for an allergen to gain access to the blood stream, the presence of Clostridia prevents the allergens getting into the bloodstream. "Clostridia are known to be closely linked to the intestinal lining, they are spore forming which makes them tricky to work with, but down the road they would be a candidate to put in a to pill as they are highly stable." Another option the researchers are investigating is finding a drug which would have the same effect as the bacteria. Image caption Can bacteria help with peanut allergies? It is hoped that using bacteria can help with desensitisation therapies, which involve giving people regular, but tiny, doses of the substance provoking the allergic response until the immune system becomes used to it. Previous research has suggested roles for our microbiome in everything from obesity to autism. Dr Cathryn Nagler says we should not be surprised how powerful an effect these bacteria, fungi and viruses can have on our body. "We have co-evolved with our microbiota and it has an enormous impact on our health. "It's having a negative impact now because we've disturbed it with antibiotics, a high fat diet and c-sections." Commenting on the findings, Prof Colin Hill, a microbiologist at University College Cork, told the BBC: "This is really interesting. "This paper identifies a group of bacteria which could be important in protecting against these prevalent diseases. "While we have to be careful not to extrapolate too far from a single study, and we also have to bear in mind that germ-free mice are a long way from humans, it is a very exciting paper and puts this theory on a much sounder scientific basis." If you want to find out more about what you can do to reduce you or your children's chances of becoming allergic watch Horizon - Allergies: Modern Life and Me, broadcast on BBC Two at 9pm on Wednesday 27th August.